1. Snipping some fingers off a pair of quilting gloves makes my life easier. I used to take my gloves off every time I had to change a bobbin, scratch my itchy eyes, or look up something on my iPad. I was watching the preview for Christina Cameli's "Wild Quilting" class on Craftsy when I noticed how she had modified her gloves. I decided to give it a try by cutting off the thumbs and index fingers on my gloves and I have no regrets! No more taking my gloves off and on. 2. Monofilament/invisible thread is super convenient. I purchased a cone of Aurifil's monofilament thread after successfully using the Coats and Clark invisible thread on my Heather Ross Scatterbrain Quilt. I highly recommend the Aurifil! I've used it on 4 quilts so far with awesome results. I still try to use a bobbin thread that matches the section of quilt top I'm working on, but I have less pressure to find the perfect matching thread this way. Normally I have no qualms about ordering matching thread, but when you have a stack of quilts to get through, it's nice to have one less thing to worry about. 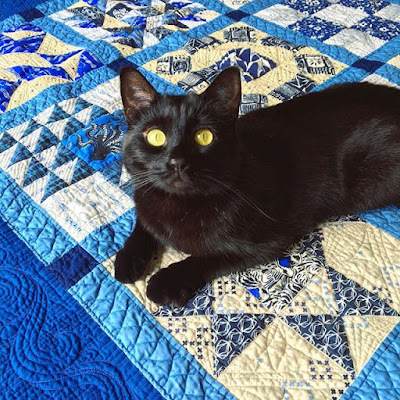 For tips on quilting with invisible thread, I suggest reading this article. 3. The Supreme Slider isn't a game changer for me. The Supreme Slider is supposed to reduce drag and help you move your quilt more easily as you quilt. I guess the extension table for my Juki is already pretty slick because I have not felt much difference while using it to merit the $34 retail price. In fact, the other day, I lifted up my quilt to change a bobbin only to realize I had forgotten to put the back Slider on my machine. I had been FMQing for 30 minutes and hadn't even noticed! I think the reason is simple: the drag isn't because of the machine surface only...it's because you're trying to move several pounds of giant quilt with your fingertips. Obviously there will be some drag no matter what. 4. Testing quilt designs using clear template plastic and dry erase marker is brilliant. I used to audition quilt designs by doodling on a sketch of my quilt, but placing the template plastic on your quilt allows you to get a feel for the true scale and execution. 5. Worry about how to quilt one section at a time. Trying to map out every detail gets overwhelming and makes me more likely to procrastinate. Instead, I just focus on the task at hand, be it one block, a border, or the center of a medallion. When that part is done, I can choose how to proceed based on what designs compliment the work I just finished. It helps reduce the pressure to find the absolute perfect combination of designs. I feel your pain! There are currently 10 top, backing, binding sets sitting on the end of my kitchen island waiting to be quilted. As I walk past we just sort of give each other the stink eye. I agree about the SS! I have one machine that is plenty slick wihout it. The other i use a teflon sheet (twice the size and $3!). That thing really is a rip off. I love using dry erase markers and plexiglass and like you, i take my design process one section at a time...worry about the rest later! Sometimes this works out to an overall design that doesnt quite mesh, BUT...it is DONE.